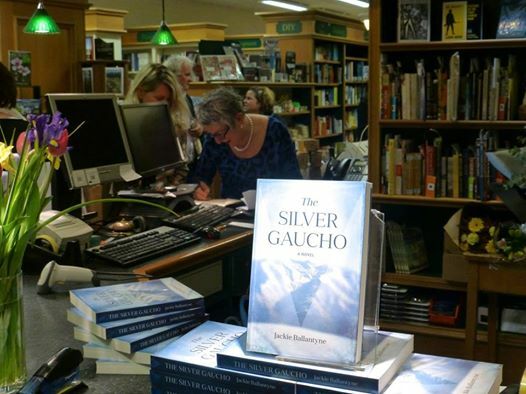 On Thursday September 4, inimitable bibliophile and book reviewer Bronwyn Wylie-Gibb launched The Silver Gaucho at University Book Shop in Dunedin. I am indebted to Bronwyn for her keen reading and observation of my work. Here’s what she said at the launch. I was slightly scared when Jackie gave me a copy of The Silver Gaucho to read, as I had reacted so viscerally to How To Stop a Heart from Beating, that I’d immediately rung the publisher, and demanded and insisted that we do a launch for this debut novel by an author I’d never heard of, and that they would have to pay for it. I was worried that I wouldn’t enjoy The Silver Gaucho as much. But I was also very curious. The Silver Gaucho was already of the edges of my consciousness – I’ve heard Jackie read parts of it and she has talked a little about the character and Argentina so I was also curious to see how the story unfolded. Turns out that I loved this book too and that despite its name, it’s not about The Silver Gaucho at all. The mystery of who and what it is about is beautifully written and quietly revealed. It starts in 2001 with the death of the Silver Gaucho, an Argentinian TV hero, whose loss devastates the whole of South America, and then jumps back to 1998 to introduce Lockie Steele, a Dunedin-based travel writer exploring Argentina – she meets the Silver Gaucho and his family, and the tale then moves between Argentina and New Zealand, between pieces of Lockie’s travel writing and Lockie’s own experiences. I liked the glimpses of Dunedin, especially the Santa Parade, learning about horses and polo and the Otago Cavalcade which I didn’t really know about as I am frightened of horses. I enjoyed meeting Solly again, the young girl from How to Stop a Heart from Beating, who is now all grown up and living in Port Chalmers – she is Lockie’s boss and, as of old, is still a truthteller. I also enjoyed Jackie’s observations of Argentina, particularly its more obviously stratified and codified society. Lockie Steele is a strong, complicated character, negotiating her somewhat damaged and fractured family and her own sometimes hard to manage discontentedness. There is a slight edge, a sliver of darkness to Jackie’s writing, it points up the moments of joy in her novels, and underlines her characters’ everyday lives, without ever falling into gothic angst. Jackie is particularly good at what she doesn’t write, I really enjoyed the various absences in this book of characters who we learn about from other characters but whom we never meet ourselves. Jackie is also masterly at surprising the reader, planting the odd sentence or idea that is revealed as devastatingly important many chapters later. I loved the originality of this book, I laughed often and was taken by suprise and tears at least once. Travelling – and being lost. Or not.